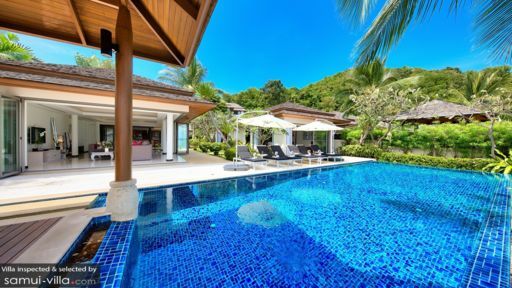 Baan Feung Fah is an oceanfront property in Bophut area, Samui, with four bedrooms and a stunning view of the ocean. The infinity-edge swimming pool extends out to the ocean as if one big water body. Enjoy the tropical breeze as you laze on the beach chairs found on a raised platform beside the ocean. The beautiful view never gets old whether you lounge in the pool gazing out at the ocean or relax on the sun chairs with a drink in hand. The villa itself is great for a family holiday or a private event as well for there’s something for everyone in and around the villa! Baan Feung Fah offers four, well-furnished bedrooms to guests of which the master suite is located in its own individual pavilion offering a luxurious stay to guests. Furnished with a four-poster, king-sized teak bed, the bedroom is fitted with a TV, and has been decorated with elegant black and gold tones. There is an en-suite bathroom with a stunning bathtub and a wood-panelled glass ceiling for overhead views. Three bedrooms are furnished with a king-sized beds and single beds that are equally comfortable. Each room features minimal décor with a hint of colour on the walls for a cheerful disposition. The air-conditioned bedrooms adjoin to an en-suite bathroom with necessary amenities. A bit of sand, sun, and sea is all you need to make your tropical getaway one that is splendid and memorable. At Baan Feung Fah, you have all this and much more since the 17-metre swimming pool meets the sandy beach in Bophut beyond which lies the undeterred ocean stretching to the horizon. The pool deck has several sun chairs upon which guests can tan under the sun, or simply bask in this glorious tropical weather, especially if you’re escaping the cold back home. There is a traditional sala with daybeds and sun chairs sat facing the ocean! The villa features a gorgeous, well-appointed living and dining area located right behind the pool, so you can traverse outdoors with ease and can even enjoy a view of the ocean. 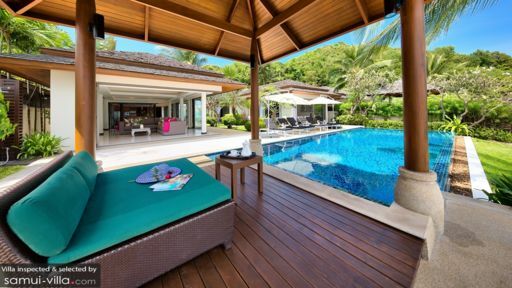 A walkway leads to the sala hovering on the pool’s edge. Furnished with comfortable sofas, artwork on the walls, and a flat-screen TV, the elegant living room is comfortable and homely for everyone to relax and rest with ease. Behind the seating is the eight-seater dining table that faces the pond and stone steps to the back of the seating. This open-concept allows for natural ventilation and ample sunlight to stream indoors. Across the stone path over the lotus ponds, one can spot the well-equipped, modern kitchen complete with a breakfast bar and amenities like double-door fridge, stainless steel microwave/oven, hob, and others. With personal guest assistance, the villa ensures that the needs of all guests are met timely and in order. Housekeeping and maintenance is well-taken care of so you have nothing to worry about. Several services are available upon request such as massages in-house, car rentals, and babysitters and these come at an additional cost. If you want, the services of a personal chef can also be appointed to take care of your meals. 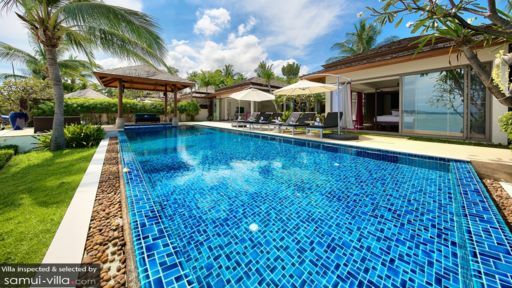 Found right on Bophut beach, the villa is ideally located as it is close to many restaurants that serve delicious local and international dishes such as Namu, Zazen, and Full Moon. Further off is Mae Nam beach inviting travellers to swim in its blue waters and indulge in water activities like scuba diving and kite-surfing. Head to the historical Fisherman’s Village in Bophut for an array of restaurants and markets selling handicrafts and other exciting products! Everyone on the trip thoroughly enjoyed their stay and I have to say it was the staff that really made the trip. Gi and the staff were always smiling, and always making sure we were well catered for. We ordered takeaways a couple of times, and to our surprise, they were there to assist us setting up the dining table and to wash up after us. I can't say enough about the staff and in fact, I would make another trip if I knew they were still there, in particular Gi. The villa was great but in the end, it was the staff that made this trip stand out.